It’s a new fiscal year, so how’s Nikon doing so far? Surprisingly good according to Nikon. Year-to-year camera/lens sales were up 2.4b yen, while operating income in the group increased 1.6b yen. The other components of the company lost money, though the semiconductor equipment group shrank their loss by 1.6b yen. As I’ve noted for some time, the camera and lens group supplies about 75% of Nikon’s sales, and more than 100% of their profits. As goes cameras, so goes Nikon. So how did they increase sales and profits? Yen depreciation, cost reduction, targeted regional distribution, and promoting more expensive products. 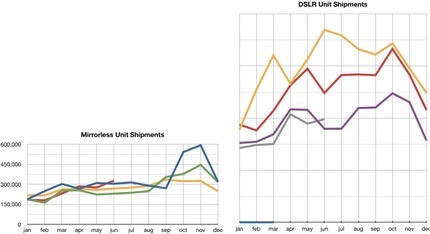 For the first time in a while, both mirrorless and DSLR shipments exceeded last year’s. However, the deeper numbers reveal something intriguing, especially for the last month of a quarter: shipments to Japan were down year-to-year, shipments to Europe was incredibly down year-to-year, and shipments to Asia were basically flat year-to-year. Yep, we’re seeing a variant of channel stuffing, which I’ll call channel optimized stuffing: shipments to the US where the dollar/yen relationship can still be leveraged were up, and shipments to “other areas” were also up for DSLRs, which could indicate dumping, but is more likely just an attempt to grab share in emerging markets. Average selling prices were up in June, too. Average selling price for a compact camera hit a new high in June, and mirrorless was nearing its high. Average DSLR selling price increased in each of the last two months, but the price range of DSLRs is so broad that new camera introductions tend to distort the numbers when you look on a monthly basis (think Canon 5DS). While the numbers for 2015 look better against 2014 than 2014 did versus 2013, I’d say there has been considerable stress amongst the camera companies to produce this year’s numbers. Everyone’s trying to mitigate any overall loss of sales and find a product or two they can ride the coattails to better results with. I know a lot of folk reading this site are interested in Fujifilm’s position in the market. They reported their quarterly results last week. Breaking down their numbers I found that Fujifilm said they sold about 840k X cameras in the previous year (remember, that includes the compact X30 and X100T). Even if we assume that interchangeable lens cameras are half that, it would put them at 1% of the ILC market (again, remember Nikon said they expect to be at 34% this year). Many of you think that Nikon needs to pay more attention to its competitors, but the numbers so far say that Nikon has paid and can continue to pay attention to what they’re doing first and foremost. One actually has to be impressed with the discipline in which Nikon manages to keep the Imaging group producing healthy numbers. Still, I believe they’re leaving money on the table by pressing the status quo, and it is clearly getting more stressful on the company to keep producing good financials. Moreover, they’re dialed in so tight and so out of touch with their actual customers that when they do produce a “hit” product such as the Coolpix P900, they underproduce it to the point where it is out of stock for a long period of time. Time is something you don’t have in the digital camera business. Lost sales today are generally lost sales, as competitors suddenly step in with something that gets the attention of the remaining camera purchasers. Nikon’s a little devoid of exciting new products to talk about right now, with the March P900 and D7200 being their last buzz-worthy introductions. At this point, I’m not expecting more than one new significant camera introduction in the remainder of this year, so Nikon’s going to have their work cut out for them as competitors continue to blitz.